There are very few events that unchurched people are attracted to like a Halloween or Harvest Festival (or whatever you want to call it). Parents and kids alike get to dress up, show off their costumes, get free candy and not feel like lighting will strike when they walk onto the church property. My church just put on their annual Trunk-or-Treat Halloween event and by my estimation, they attracted roughly 3 times more people than their average Sunday attendance. 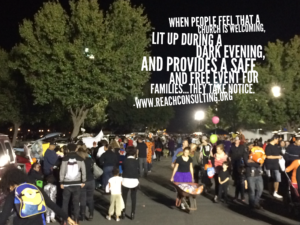 When people feel that a church is welcoming, lit up during a dark evening, and provides a safe and (hopefully) free event for their kids, they take notice. What better way to care for your local community than to provide a safe encouraging environment during a night that is otherwise dark, uncertain, and sometimes unsafe? During our event, I met several people while ushering my kids from game to game. Many did not live in my neighborhood, but when I invited them to church, they seemed quite interested. One commented that he had seen the church many times while driving by, but this was his first time attending an event. He genuinely seemed interested in my offer. One lady I met mentioned she lived 10 miles away. When I asked her why she didn’t do the typical trick-or-treat around her neighborhood, she said her neighborhood is way to dangerous. She refuses to walk around at night because the high crime in her area. A church event is the only option for her and her family. A large event of this type can often show the local neighborhood that you exist, that you can “have fun” (a rare thought for people who think Christians are too uptight), that you do ministry in a modern context, and that you want to be a part of the community. It’s called an attractional event for a reason: it attracts people! Churches are made up of people and we need to reach more people. Certainly nothing is better than the personal relationship built between two friends and one invites the other to Sunday morning. But it’s not the only method and often that first step for an unchurched person is scary. A soft fun event of this type might just be that easy first step they need. So should your church put on a Halloween event? Or should you encourage your members to stay in their neighborhood, go door-to-door, and be a light to the local homes in the area? At Reach Consulting, our answer is…it depends! We understand every church is different, every neighborhood is distinctive, and how the church members need to interact and reach their local communities is unique. We’re not convinced there is one right answer here. But we are convinced you need to be convinced of your answer to this question. Gather your team, have an open discussion about the benefits and drawbacks to hosting an event. Have an equal discussion about choosing to encourage your members to stay in their neighborhoods and meet their neighbors. Be open and honest in your discussions, recognizing you may have dissenting opinions about which method is best. In the end, decide one way, and stick to it, being convinced of your direction. Next year, do what you’ve decided and then evaluate when it’s over. The great thing about Halloween is that is comes every year! This gives you the chance to change next time around if you didn’t see the results you wanted. So what about your church? Does your church do an event or do you encourage your members to stay in their own neighborhood? Let us know!